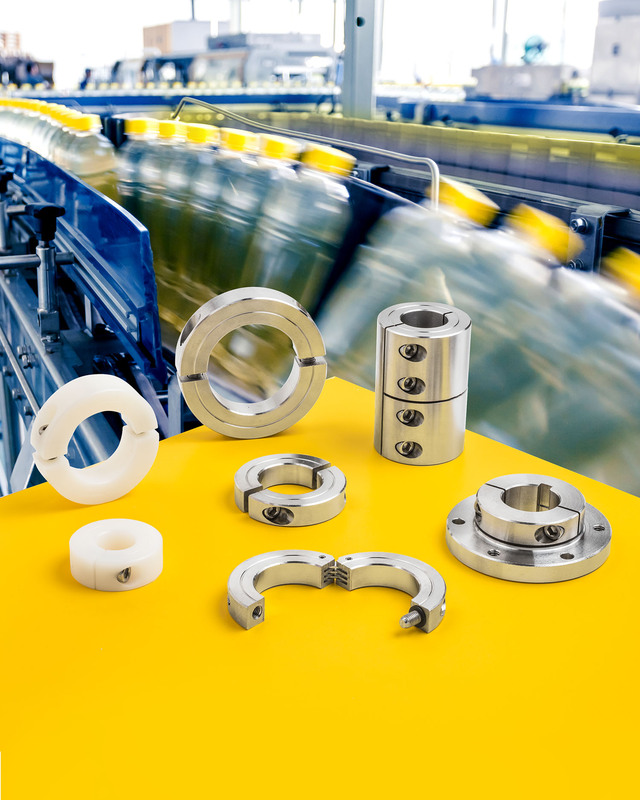 A wide range of standard and custom shaft collars, couplings, and mounting components for food and beverage processing, conveying, and packaging appli-cations are available from Stafford Manufacturing Corp. of Wilmington, MA. Stafford Shaft Collars, Couplings & Mounting Components are made from FDA- and USDA-approved materials to match user requirements for food and beverage process systems including conveyors, filling equipment, and ovens. Made from Nylon and Delrin® with stainless steel fasteners, 303 and 316 stainless steel, and high temperature alloys they come in a variety of configurations. Available as one-, two-piece, and hinged shaft collars and flange mounts, Stafford Stainless Steel Collars, Couplings, Mounting Components and those made from high temperature alloys are offered in 1/4” to 14” I.D. sizes, depending upon material, and the Nylon and Delrin® collars come in 1” to 4” I.D. sizes. Special bores, keyways, and other treatments are offered. Stafford Shaft Collars, Couplings & Mounting Components are priced according to material, size, and quantity. Price quotations are available on request.